Clarence and Cindy and Adelma Kaiser show off some gold they mined at K-15A using a home-made high-banker. Look for the full story in next month’s newsletter! As most of our subscribers are aware, California has placed a temporary moratorium on suction dredging until the State completes an update of the Environmental Impact Statement which supports our suction dredge regulations. The process is already well underway. We have created a special page on our web site so you can follow the progress if you are interested. While the process is moving along, we do not expect it to be completed in time for the 2010 dredging season in California. 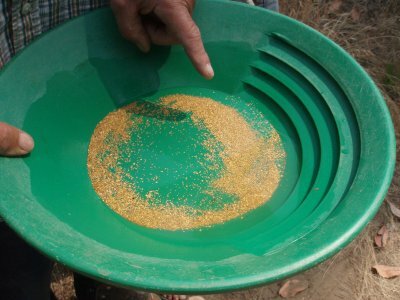 So we have identified around 40 miles of suction dredging opportunity in Southern Oregon for our members who prefer this type of gold prospecting (see below). The moratorium on suction dredging in California only stops suction dredging within California’s active waterways. 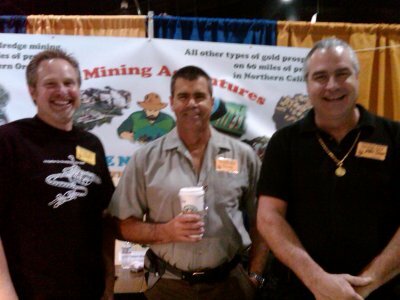 It does not have anything to do with the other types of prospecting or mining that we do. Unaffected prospecting activities include panning, sniping & vack-mining, sluicing & high-banking, electronic prospecting and other types of prospecting that do not use a suction nozzle within an active stream, river or creek. It also does not affect our group weekend projects. Fantastic Prize Blowout; Here are the Winners! We Raised $33,536 for Industry Defense! We brought in a total of $33,536.70 to the legal fund. We expended $34,241.45 directly to legal and lobbying expenses (this means only to attorneys and lobbyists). I want to take this opportunity to thank all of you loyal supporters out there who have been helping us keep up the good fight — and also all of the venders and individuals who contributed prizes to our drawing. We should all pause for a moment and give ourselves a pat on the back for doing a great job. We are still in the game! On a more sober note, our legal fund contains $1,128.18 as I write this newsletter, and we owe $11,224.03 for past legal services to our attorneys. Our legal expenses will continue. So I encourage everyone to please keep helping us to pay our specialists. Even though we are not yet advertising the next fund-raiser, our girls will automatically create prize tickets in your name (for the next prize drawing) for all contributions that we receive (this began immediately after the drawing was completed on 4 January). I met with Jim Yerby a few days ago, and he says we are already off to a good start in bringing in new prizes for the next drawing. In addition to that, long-time highly-supportive member, Steve Kleszyk, has organized a ‘Pound of Gold for the Legal Fundâ? campaign on our Internet Message forum. So far, we have brought in nearly 3 ounces of gold. Likely, we will use some or all of the gold received in this program as prizes in the next big legal fund-raiser. Thanks for whatever you can do to help us continue to pay the legal and lobbying specialists who are defending our industry! All members are invited and encouraged to participate in our booth at the following shows. We have a lot of fun. Doing these shows allows us to share some quality time together outside of Happy Camp. If you can work a day or two into helping us, please contact Montine or Myrna in our office so we can schedule and plan on your help. Montine or Myrna can be reached at (530) 493-2012. Finding high-grade gold on the Rogue River! Oregon’s annual suction dredge permit presently costs $25 per year for both residents and non-residents. 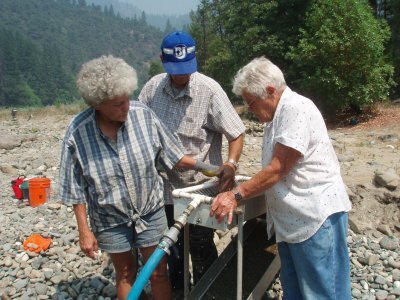 We struck high-grade gold on our dredge sampling project along the Rogue River. So you will be hearing much more from us during the next few months about how we intend to support our members who wish to operate your dredges over there. We are in the process of printing maps and an Access Guide for all members who wish to suction dredge during the 2010 season. Members are invited to contact our office for more information. Meanwhile, as you know, we continue to have the best high-banking opportunities anywhere — along the Klamath River in Northern California for members who prefer prospecting for gold above the water.